Twenty-nine per cent of health professionals would not recommend e-cigarettes to cancer patients who already smoke, according to research presented at the 2018 NCRI Cancer Conference. While e-cigarettes may pose some health risks, evidence suggests they are much less harmful than smoking. Health bodies, including Public Health England and the Royal College of Physicians, have given support for the use of e-cigarettes as a less harmful alternative. Researchers say their findings highlight the need for clearer guidance and training for health professionals around endorsing e-cigarettes to cancer patients who smoke. The study was presented by Dr. Jo Brett, a senior research fellow in the faculty of health and life sciences at Oxford Brookes University, UK. She said: "Smoking is a well-established risk factor for many common cancers. It is the single biggest avoidable cause of cancer in the world. "Problems caused by smoking continue after a cancer diagnosis. It increases the risk of treatment complications, cancer recurrence and the development of a second primary tumour, leading to an increased risk of death. So it's vital that these patients are encouraged to stop smoking. "E-cigarettes are now the most popular intervention for smoking cessation in the UK. However, little is known about health professionals' knowledge and attitude towards e-cigarettes and whether they are endorsing use of e-cigarettes with cancer patients." Dr. Brett and her colleagues surveyed 506 health professionals from across the UK, including 103 GPs, 102 oncologists, 100 cancer surgeons, 103 practice nurses and 99 cancer nurse specialists. Health professionals were asked about their knowledge of e-cigarettes, whether they would recommend them to cancer patients who smoke and what their hospital or practice policies were on the use of e-cigarettes. Overall, 29% said they would not recommend e-cigarettes to cancer patients who smoke. More than half of those surveyed said they did not know enough about e-cigarettes to make recommendations to patients. A quarter did not know whether e-cigarettes were less harmful than smoking. 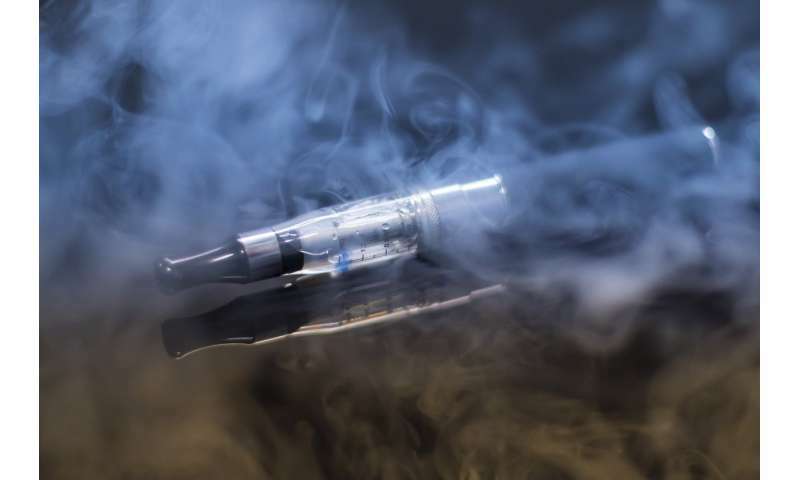 Forty-six per cent said their hospital or clinic did not have guidance on what advice they should give to patients about the use of e-cigarettes, with a further 45% saying they did not know if guidance existed. Dr. Brett added: "These results suggest that there's a lack of clear policy on e-cigarettes at the local level. They also suggest a lack of awareness of existing evidence and national policy on e-cigarettes among doctors and nurses. This is coupled with a lack of time and inadequate training on smoking cessation in general, and specifically on e-cigarettes. "Giving patients a clear message that they can reduce harm by switching from smoking to using e-cigarettes may help them cut down or quit smoking tobacco. This could help patients by reducing the risk of cancer recurrence, a second primary cancer or other complications." Dr. Brett says that hospitals and clinics need to develop policies on e-cigarettes for harm reduction in cancer patients who smoke, and she believes health professionals need training to improve their knowledge of the existing evidence and policy on e-cigarettes. She hopes to continue this work by developing and testing ways that e-cigarettes can be used to help cancer patients to quit or reduce the number of cigarettes they smoke. Linda Bauld is Professor of Public Health at the University of Edinburgh and a member of the NCRI Cancer Conference Scientific Committee, and was not involved in the research. She said "Studies like this are valuable because they shed light on the real-world application of evidence and show how it is being translated in to practice. "Although we have evidence to show that e-cigarettes are a substantially less harmful alternative to smoking tobacco for cancer patients, this survey highlights that not all health professionals know this. They are unsure how to talk to cancer patients who smoke about e-cigarettes. It also suggests that doctors and nurses need better information and clearer policies to guide their discussions with patients." More information: Abstract number 2171, 'E-cigarettes as a smoking cessation aid in cancer patients: health professionals knowledge, attitude and current practice,' Jo Brett et al. Proffered Papers session, Dochart Room, 08.15 hrs, Tuesday 6 November.